← Happy Two Months to Us! So, the trips are 37 weeks gestationally and 9 weeks old today. 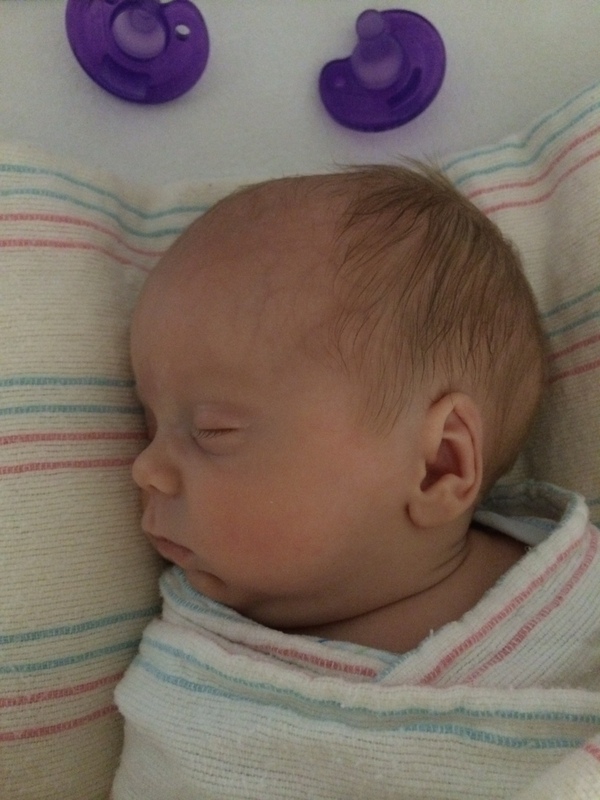 Because we hit the 60 day mark and were still hanging out in the NICU (did I mention we’d been moved AGAIN? We’ve now had the grand tour…) their immunizations have begun. Two down, one (maybe two to go), so we should be going home soon. For real this time. No more preemie pranks, guys! Other: Did you ever think Henry would be the first to come home? Well, we’re now looking at bringing the whole gang home at once (perhaps that was their plan all along) but if not for his immunizations, Henry would have been home as soon as he finished that car seat test. When I say he feeds by mouth without incident, I really mean without incident. As in, without incident ever. He is our star feeder! Other: While all three of our little loves are grunters, Jack is the loudest little piglet of them all. Now, I will take grunting over crying ANY day. It’s actually pretty cute. He’s most likely to do it when I’m across the room sitting with Sophie, and you’ll just here this grunting and squealing (seriously, it’s piglet-like), and you’ll look over to see Jack’s blankets moving to and fro. Being the mellow fellow that he is, it’s not surprising that when he clamors for attention, all he does is shift around a bit and grunt. Do we have our first Halloween costume? Three little pigs, anyone? *She’s still a bit gulpy (especially when she’s hungry) and every once in a while in her ravenous state–you would think we don’t feed this butterball 8 times a day, pretty much right on schedule–she neglects to breathe sometimes. But she’s gone from not pacing herself at all (i.e. you have to yank the bottle out of her mouth which is harder than it sounds because she’s such a strong sucker!) to pacing herself for 50% of the feed, to pacing herself for about 85% of the feed. Other: So yesterday, Lisa (the physical therapist) and I were going to have our last infant massage session, and we planned to try it on one of the bambinos. Since Sophie doesn’t sleep between her 12 and 3pm feeds — no crying, just hanging out, staring at the ceiling tiles–we thought she’d be the perfect candidate. So there Sophie was, doing her “I don’t really need to sleep” thing, for at least an hour and a half. Lisa and I get all ready, head over to her bassinet, and what should we find? A sleeping little princess. When Lisa joked that Sophie was playing games with us and that as soon as we walked away she would be up and at ’em again, Sophie smiled. I kid you not. Full-on, teeth-baring (if she had teeth) smile. We’ll never know if she was really sleeping or not, but if I know this girl, I’m betting not. You must be thrilled the trips are nearly ready to be discharged and you can take them home. They look so healthy and have grown hugely! Love the nursery. Only photo you need to post when they go home is one of them in their cots…what a journey. So happy for all of you. Happy two months!! They are so strong! Their immunizations must seem like a walk in the park compared to everything else that they have been through!!! !